Managing pain is an important part of dental care — alleviating pain caused by disease or trauma and reducing discomfort during and after treatments. In many of these instances we can do this effectively with mild, over-the-counter drugs like ibuprofen or aspirin. These Non-Steroidal Anti-Inflammatory Drugs (NSAIDs) are safer and have fewer side effects than stronger prescription pain drugs, and have proven effective after extensive studies. Nevertheless, they can cause problems if not taken properly. NSAIDs work by blocking prostaglandins, substances released by diseased or damaged tissues that have become inflamed (swollen). Inhibiting prostaglandins reduces inflammation that in turn eases pain. This differs from steroids that reduce inflammation by suppressing the immune system or narcotics like morphine or codeine that act on the brain to reduce pain. Both steroids and narcotics are strong, prescription medications used only for severe pain, and can be addictive if abused. While NSAIDs aren’t as habit-forming and have milder side effects, they can cause significant health problems if overused. The most common is their tendency to act as a blood thinner, which decreases the blood’s ability to clot. This can lead to serious complications: over-extended use of aspirin, for example, can damage stomach lining and give rise to ulcers or dangerous bleeding; ibuprofen can damage the kidneys. An estimated 100,000 Americans are hospitalized each year due to ulcers or gastrointestinal bleeding linked to chronic NSAID use for pain relief. They’re not recommended for patients who are pregnant, have preexisting stomach problems or heart disease. In short, NSAIDs are best used for only brief periods to alleviate short-term discomfort. Unless otherwise directed by a physician, a single dose of 400-600 milligrams is safe and normally sufficient for about five hours of mild to moderate pain relief; daily dosages shouldn’t exceed 2400 milligrams. 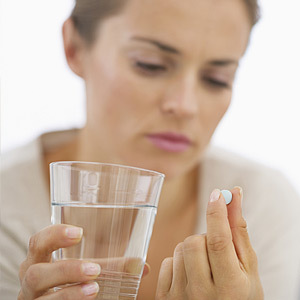 NSAIDs remain the best approach for alleviating most dental pain and discomfort. Taken properly, they can help you cope with pain until you’re back on your feet again.